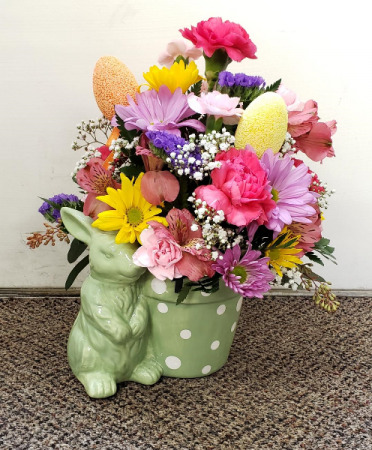 Ceramic bunny container with a mix of springy colors and accented with Easter eggs. Hippity Hop! Local only. 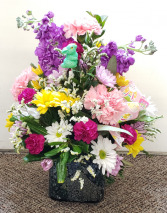 Fresh springy mixed colored flowers in a beautiful crackled vase accented with a bunny pick. 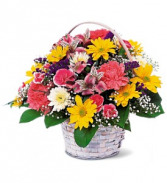 Perfect to brighten up anyone's Easter! 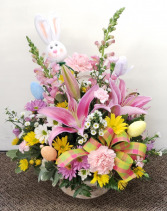 Fresh cut mixed flower arrangement in a basket with an adorable bunny pick and Easter egg accents.